A graduate of Immaculata in 2014, Liz Fitzsimmons participated in the cheerleading program all four years as both a game day and competition cheerleader. She served as captain of the basketball/competition squad as a senior. Liz is currently enrolled at Seton Hall University, where she is majoring elementary education and special education. "During my time at Immaculata," says Liz, "the cheerleading program and the coaches made a huge impact on me. I'm so honored to be able to pass down the traditions and lessons I have learned from this program: leadership, hard work, and teamwork. These are valuable lessons for the members to carry with them for the rest of their lives. In addition, I have fostered so many important friendships in my life through cheering and really benefited from observing my coaches guide our team. 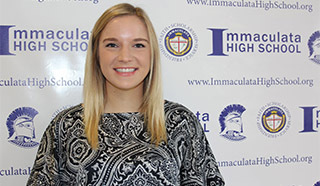 "I am excited to begin this journey at Immaculata and be able to give back to the school after all it has given me. Go Spartans!"